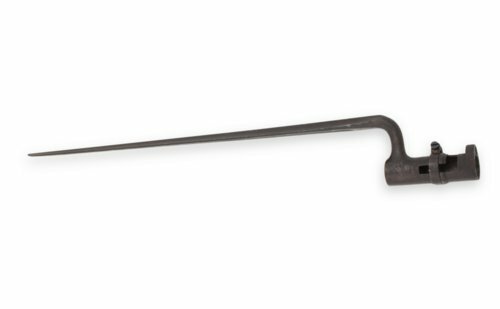 This steel bayonet for a U.S. Rifle-Musket, model 1855-1870 was found at Gettysburg during the Civil War by Theodore F. Garver, a soldier with the 26th Pennsylvania Militia, Company A. This regiment met an advance body of Confederate skirmishers near Gettysburg a few days before the famous battle, and was forced to retreat towards Harrisburg. Part of the regiment, including young Garver, was captured by the enemy and held prisoner until shortly after the battle, when they escaped and rejoined their command. Following the war, Garver moved to Topeka where he served as a judge and member of the local Board of Education.